The Lakelse Provincial Park encompasses two seperate areas on the north and east shores of its namesake lake. "Lakelse" is a Tsimshian Indian word meaning "freshwater mussel" referring to the mollusc found in the Lakelse Lake and River. The waterways of the park are noted for their excellent swimming and fishing. Five species of salmon, steelhead, rainbow trout and Dolly Varden are resident in the parks lakes and rivers. 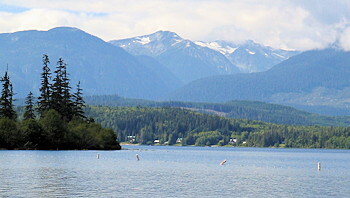 A forest of western hemlock, western red cedar and Sitka spruce is home to wildlife species such as moose, coyote, wolf, black and white kermodei bear. 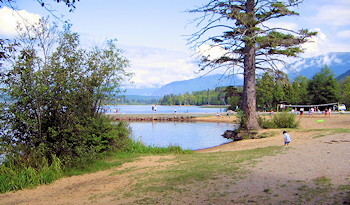 Lakelse Provincial Park is located 25 km south of Terrace and 40 km north of Kitimat. Access to both sections of the park are possible from Highway 37, 20 km south of Terrace. Camping - The 156 unit campground provides water, wood and toilets. Picnic areas and good beaches are located nearby. Fishing and Boating - A boat launch allows the avid angler access to the parks waterways where the fishing is excellent. Hiking and Trails - Trails provide access to various beaches, picnic areas and notable features of the area.